Stone crushing solution and equipment operation service. The stone crushing production line Dan Costea bought just for reselling to the project executive in Sf ntu Gheorghe in Romania. BIMETAL Romania is a Romanian private company dealing with used machine tools. BIMETAL Romania mainly provides from Romanian market a various type of used and new machine tools, such as vertical lathes, gear hobbing machines, horizontal boring machines-facing lathes, CNC machines and many others. At the same time, they also buy big-size engineering construction machinery and equipments overseas for local construction company. As the project in Sf ntu Gheorghe begin, more and more mining equipments like portable crusher and belt conveyor were in need. BIMETAL Romania filtered several mining equipment manufacturers at home and abroad and finally chose SBM as their supplier. Mr. Dan Costea listed the equipments they needed and SBM designed a 450t/h stone crushing production line solution with vibrating feeder, primary crusher (PE series jaw crusher), secondary crusher (CS series CS cone crusher), vibrating screen and belt conveyor. 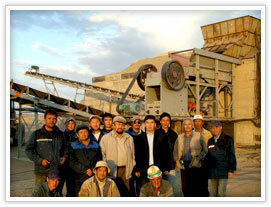 Customers in Romania enjoy the high performance and high capacity grinding equipments from SBM.